Today I am sharing practical and thoughtful ways to help a friend on bed rest including several helpful resources. Having been on bedrest twice for extended periods of time (four months and one month) I was blown away by the kindness of friends and what they did for me. I am happy to share those with you today! I think there are two kinds of bed rest: The kind where if the mom does what she’s told (i.e. stay in the bed) then there’s a good chance she’ll make it close to full-term and deliver healthy a healthy baby. Then there’s the kind of bed rest where even if the expecting mama does what she’s told the risk is high that she’ll deliver early, potentially with complications or a NICU stay. Many of these pregnant mamas have to be hospitalized in the antepartum ward of the hospital which can be a scary, lonely, and very confined space. I differentiate between the two because how you talk to and help these friends might look different, especially when you take into consideration their personality type. For example, friends who are on home modified bed rest might love a Bachelor-watching party or visitors galore to pass the time. But given the severity of my situation, I didn’t have any desire to watch endless Netflix shows or really even talk to friends on the phone. I only wanted my closest friends to visit. Every ounce of energy was devoted to keeping my baby alive and inside me for as long as possible. So consider which position your friends is in, and her personality, as you think of ways to help. Whatever you do or offer to do will be appreciated. Offer to bring a meal or ask for their meal calendar link. Even better, offer to set up a meal calendar for her. Put a cooler on her front porch so they don’t have to coordinate with someone to accept the food. One mom suggested two meal calendars: one for lunch for the mom in the hospital (visitors break up the day) and one for the family at home. You can use meal delivery apps if you are out of state or have to work. Meal calendars often take care of dinner but often don’t include dinner. So make a full grocery run or give a gift certificate to a grocery delivery service like Shipt or Instacart. 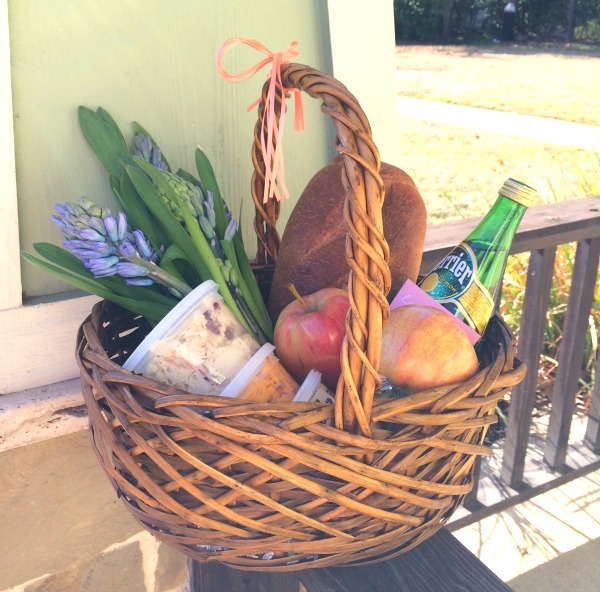 Or drop off a beautiful food gift basket. Tip: When signing up for a meal calendar try to put what you are bringing or fill in after the fact. It really helps in avoiding dinners from the duplicate restaurants. Have her daughter on a playdate, offer to pick up her son from soccer, offer your nanny for a day you don’t need it. One of my friends would bring one of my daughters to visit me at the hospital so I could have time with her away from her sisters. Care calendars can also coordinate childcare. There are non-profit organizations that provide childcare for stay-at-home moms who become ill or bedridden. 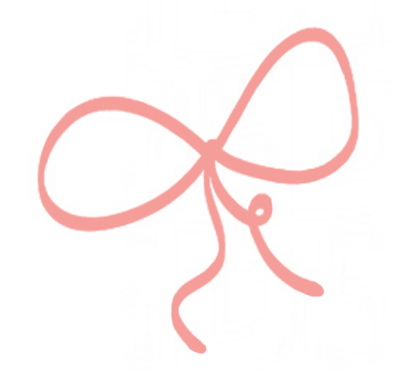 Mommies in Need in Dallas is one such organization. Research and see what similar organizations are in your area and suggest them to your friend. Tip: If she’s in the hospital, offer to babysit at night so her husband can spend time with her after the children go to bed. Suggest to your friend to keep a running list of to dos and help her tackle that list. Delegate friends to help with some of the other things. Dry cleaning every week? You can do that. Dog to the groomer? That’s one more little mental note you can take off your list. Thoughtful Idea: If you are at Target or the grocery, send a quick text and ask what she needs. She may not respond, and that’s ok, but knowing you even offered means a lot. Bed rest is quite confining so fresh flowers or a new candle or diffuser (this one is my favorite) can make such a difference. When I was on hospital bed rest, a friend decorated my room and it made it so much better! If you’re a close friend or family, offer to clean her house or throw in a load of laundry while you are visiting. Some moms don’t feel comfortable with that so you could always offer a housecleaning service for an afternoon. Not having the joy of prepping for baby and nesting can be so frustrating for a mom on bedrest. See what you can do to help: paint the nursery, frame some art, put together the changing table. Make her a care package filled with healthy snacks, magazines, a favorite new book, a new pretty lipgloss, hand lotion. Give her a cute lounge outfit or pajamas. I wore this wrap nonstop or the popular Barefoot Dreams cardigan is nice to wear when visitors stop by unexpectedly. Pretty slippers or a nice pillow for the hospital. Having a breakfast tray was essential to being on bedrest at home but something helpful for the hospital is a laptop tray. A nice brush for all the tangles she will get being in the bed all the time. (I’ll never forget my sister brushing all the mats out of my hair). Adult coloring books or a craft project might be of interest. And, y’all, a really good dry shampoo might be the BEST gift of all. I could only take showers twice a week so dry shampoo was a must. I shared so many more ideas in this post about what to bring a friend in the hospital. 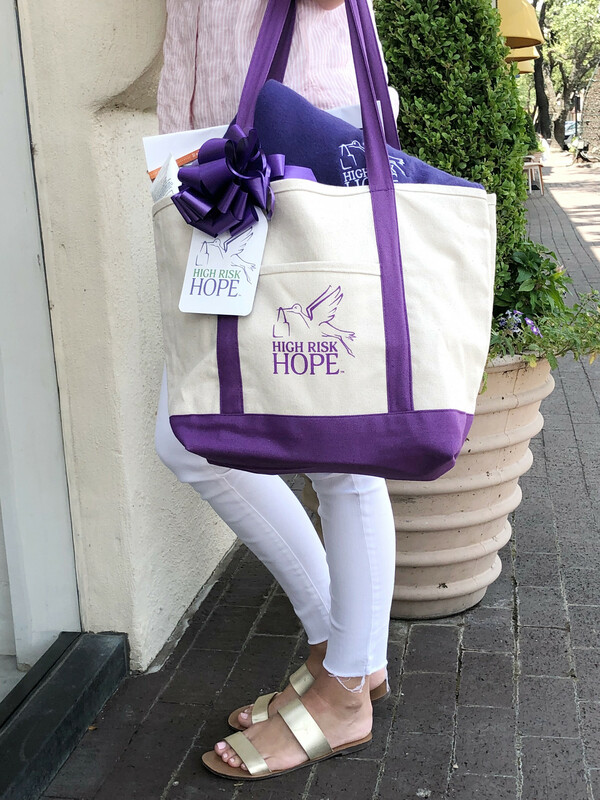 And there’s a wonderful organization called High Risk Hope where you can purchase a bed rest basket full of essentials a mom on hospital bed rest needs (but the hospital does not provide). This would be such a thoughtful gift to send to someone! 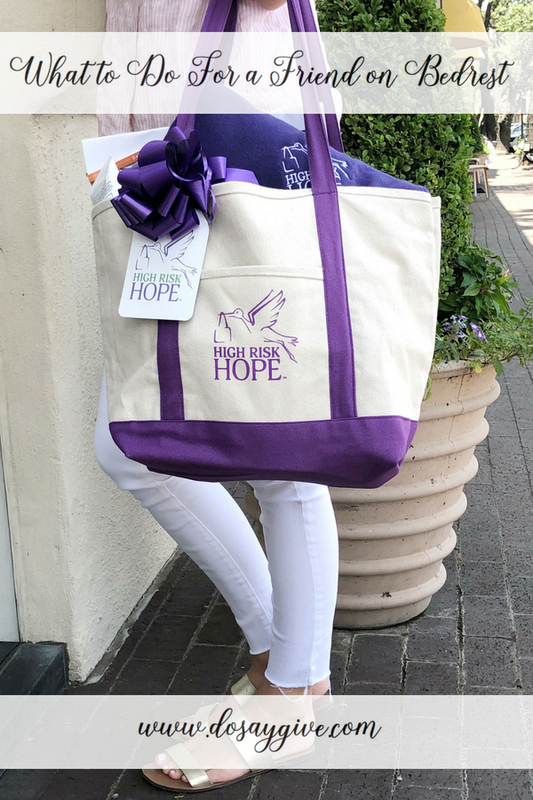 High Risk Hope offers many ways to supports mom on bedrest and with babies in the NICU, including patient stories of hope. The best gift someone gave me was finding someone to come to the hospital to give me a mani/pedi. It made me feel like a new person! In Dallas now Cherry offers in home and in hospital manicures. Use code DOSAYGIVE for $10 off your first service when you download the app. When I was on bedrest with my second child we updated my pregnancy gestation on the hospital dry erase board. Every new week was a HUGE victory. Celebrate the milestones with a special treat or text. Bed rest mamas hear a lot of negative things from the doctors, suffer internal guilt about being away from her other children, and can experience deep loneliness. So encourage her however you can. Maybe put together a playlist of encouraging or uplifting music. (I have a list on my Instagram highlights). One friend emailed me a list of encouraging Bible verses that helped her get through a scary pregnancy. I put them into a printable you can download and print or email to a friend. I had other friends who would randomly text or email me encouraging messages and verses. They didn’t expect a response and that alone meant so much. Other friends randomly dropped a treat off or left a smoothie at the nurse’s desk. Something little meant so much. Don’t share scary pregnancy stories, visit unannounced, or share the details with your children (because they may share with your friend’s children). Don’t expect a return text or call or even thank you note. And do not visit a high-risk pregnant mama or her children if you are sick or anyone in your family has been sick. It can put her and her baby at risk. Even what you think are “just allergies” can give anxiety to some germaphobe mommies. I was recently on The Home Hour podcast and shared more ideas for how to help a friend who is sick or on bed rest. We talk about appropriate and helpful things to do if you are just an acquaintance or casual friend but still want to help. Listen here for more great tips! Pin this post to remember “what to do”! Thanks so much for sharing! I wish I had this on bed rest but hopefully it will be of help to readers seeing this! I loved reading all these ideas and will work to incorporate some of them into our neighborhood support of an older friend who was just diagnosed with cancer. Some of these ideas can be incorporated into our neighborhood support of an older friend who was just diagnosed with cancer.